In June 2012, Scott B. over at Expedition Portal starting discussing a third Desert Expedition for early summer 2013. The early planning just talked about a trip to visit ghost towns in Nevada. Several jumped in with possible locations to include and some early commit-ers saying they were in as well as a couple of the “regulars” who had taken part in DE 1 and/or DE2. In January 2013, my plans to retire in March were firming up so I committed to joining in. Good thing I did as Scott capped off the list shortly thereafter. I said goodbye to my employer and officemates in March and started getting ready. The roadways indicate that this was a trip for the truck and I decided to take the Little Guy as the truck bed, at 5 feet, is too short for me to sleep in except in emergencies. As provisioning stops would be few and widespread, I had to add capacity for water and fuel. While I probably overdid, I carried about 20 gallons of water and 10 gallons of gasoline in containers. 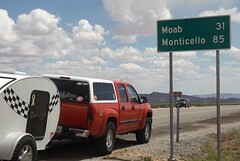 I also carried my Edgestar refrigerator/freezer (works on AC or DC); tools; recovery gear; clothing; and some food with plans to restock and finish loadout with perishables before we met up in Cedar City, Utah. Also included in my packing was my SPOT messenger which allows me to check in with a select group of family and friends with my progress even when cellphone service isn’t an option. 5482 miles driveway to driveway. 2 blown tires (neither were mine but both went to the same guy). Gas: 306 gallons. High price $4.199; low was $3.599. Bottles of water consumed by me 22. Post cards sent home 8. Animals: Fish (too many to count in a couple of springs and stock tanks); Reptiles – lizards only (no snakes); Mammals – horses (wild and domestic); donkey; jack rabbits; dog; cattle; pronghorn antelope; 1 dead field mouse. Extra-terrestrials (none confirmed but I can come up with no other explanation for the knot on my head and walking into a tree in a broad daylight outside the Little Ale’ Inn). Good fellow travelers 7 human, 1 canine. Jerks in our party – 0. Pictures taken 1312. (Don’t worry I won’t try to share them all). 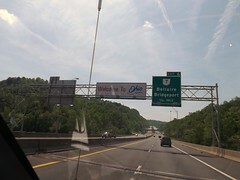 I left home Friday morning, May 17th. We were supposed to meet on Tuesday morning and I figured on a nice leisurely trip out of about 4 days putting me in town on Monday sometime. I planned to get at least part, if not all, the way across Illinois the first day. I had a bit of adrenaline going as well as the uncertainty of how far I’d feel like driving on subsequent days so I got all the way across Illinois and decided to try to get out of range of St. Louis morning traffic. Using the GPS, I started looking for a Comfort Inn around midnight and got directed to an empty lot. (So much for recently updating the GPS maps!) By that time, I was pretty beat and stopped for gas and a walkaround and then noticed a Walmart at that exit. (Walmart has a general policy — there are exceptions — of allowing RVs, even little ones, to spend the night in their parking lots.) I stopped in and picked up a pan I had not gotten at home and checked to make sure they allowed for overnights. So back out to the edge of the parking lot and a couple of hours of sleep in the Little Guy. I woke up before sunrise and got rolling again across Missouri. My route took me on the outskirts of Kansas City in the early morning. Topeka, Kansas was later in the day and looked like it might be more picturesque as it is the capital of the state. While I passed within sight of the capitol building, it was covered in scaffolding for a renovation project. So onward to the wide open plains. Totally different from any part of the country I had seen before and breathtaking. To tell the truth, it was breathtaking the first couple of hundred miles but got repetitive after that. Scooting across Kansas, there was a couple pulling a Scamp or Casita trailer that seemed to be stopping at the same rest areas. One time, I would pull in as they pulled out and then later they would pull in as I pulled out. We did eventually talk when we reached the Colorado welcome stop. They winter in Florida and were on their way to sons near Ft. Collins for the summer. We spent some time comparing notes on trailers and came to the conclusion that theirs is more livable but in a world of $4.00/gallon gasoline, mine was preferable for towing. 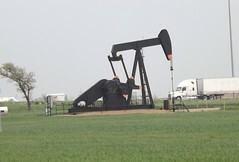 While in Kansas, I saw the occasional pump jack in addition to wind farms. I guess that Kansas is covering their bets on two different sides of the energy issue. Also in Kansas, I heard reports of nasty weather which always seemed to be about 40 miles behind me. In a couple of days, the devastating tornado in Moore, OK would hit. 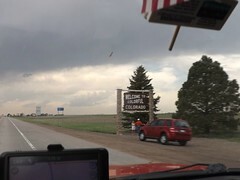 I pulled out of the Colorado Welcome Station as the rains hit. 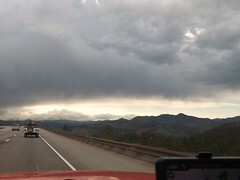 I drove out of the rain and back into the sunshine pretty soon but was seeing clouds on the peaks around Denver. Seemed like a good time for gas, so I pulled into a rundown looking truckstop. The gas pumps wouldn’t accept my credit card and I assumed it was related to the seedy look of the station and paid cash. Several declined purchases later, I called the credit card company. You know that ad where the couple is thrilled that the Bank has stopped their card from being fraudulently used in a foreign country? Its not all smiles when you’re trying to use your card and find that your bank (or credit union) decides that buying gas on a cross country trip is “suspicious activity”. Just 20 minutes on hold and we can get this all taken care of. Sheesh! . Buying gas proved to be a good idea as the trek up the mountains and through the pass was sucking down some fuel. As I neared Vail, we added precipitation into the mix and it was sticking. It was close to dark, I didn’t know what the roads or the weather had in store for me and my efforts to find a motel that night before hadn’t turned out well so I holed up in the Comfort Inn in Eagle CO for the night. A hot shower and comfy bed sure felt good. It had been a long day (or two). I figured I had about 450 miles to go before Monday night so I was in good shape. Sunday morning found me paralleling and in sight of the Colorado River for a while. The engineering of stacking an Interstate Highway on top of the river and squeezing the railroad tracks in there as well impressed me. 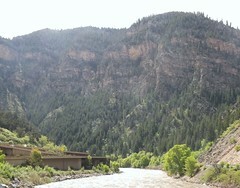 And don’t forget to squeeze in a parking lot and river access, too! As I moved into Utah, things didn’t really level out but the slopes seemed to be gentle and the views longer. The weather was still mixed but mostly good driving weather. And what does every 4×4 driver think of when they think of Utah? Moab, of course. So here I am, easily a day ahead of schedule within 30 miles of 4×4 Mecca. So what do I do? I take the safe way out. No one knows quite where I am, I don’t really know my way around and I have this great trip in front of me. So, Moab is close but oh, so far away. Something else to stay on the “to do” list for now. The views are breathtaking but the locals have seen them before. I got an earful at this rest area after driving through a construction zone at the speed limit (65) for holding up these nice folks…but in spite of me, they still had time to stop and catch the view at the rest area? 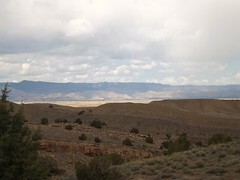 I pulled into Cedar City on Sunday afternoon a full day ahead of my schedule. Luckily my motel had a room available but not the room I had reserved for Monday night. It was fine by me. 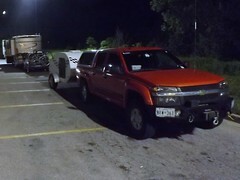 I sorted the stuff in the truck, did some shopping/provisioning and filled my gas and water jugs. I even got my walk in while doing some sightseeing. Cedar City has an extensive Veterans Memorial Park which I enjoyed. I was surprised to find water running in the rain gutters along the road. I figured it to be waterline maintenance or such but later figured it was the runoff from lawnsprinklers which seemed to be running everywhere with no particular concern for missing the grass. Cedar City also has an “historic” downtown Main Street which includes a drugstore complete with old-fashioned soda fountain in the old Sheep Association building. Take note of the bronze statues of historic figures on the sidewalks. Similar idea to the OBX Pegasus statues and DC’s donkeys and elephants but classier. 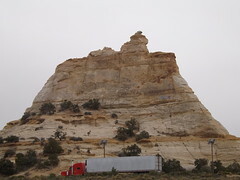 This entry was posted in 4x4 travel, Nevada desert trip and tagged 4x4, BLM, Colorado, Colorado River, cross country, friends, GPS, happy tracks, Illinois, Indiana, Kansas, Little Guy, Missouri, Moab, Nevada, Ohio, roadtrip, teardrop, Utah by Keith. Bookmark the permalink.